So, as we continue to enjoy our British Summer, I would like to celebrate the abundance of seasonal vegetables available at this time of the year. Along with birds chirping early in the mornings and long, sunny, warm summer days, the variety of vegetables, bought or home grown, really allows me as a home cook to get creative in the kitchen. Resulting in a Roasted Summer Vegetable Orzo Salad that is a delicious celebration of easy summer cooking, using a variety of seasonal vegetables. 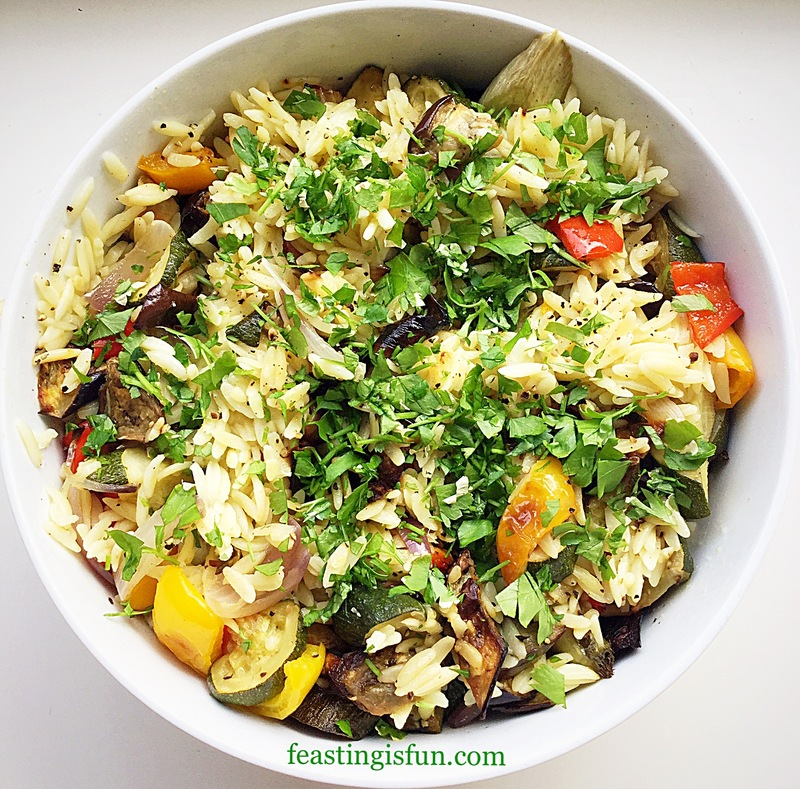 Roasted Summer Vegetable Orzo Salad. Packed full of roasted veggies in a lemon vinaigrette, this dish can be either served on its own, or as a colourful side dish. 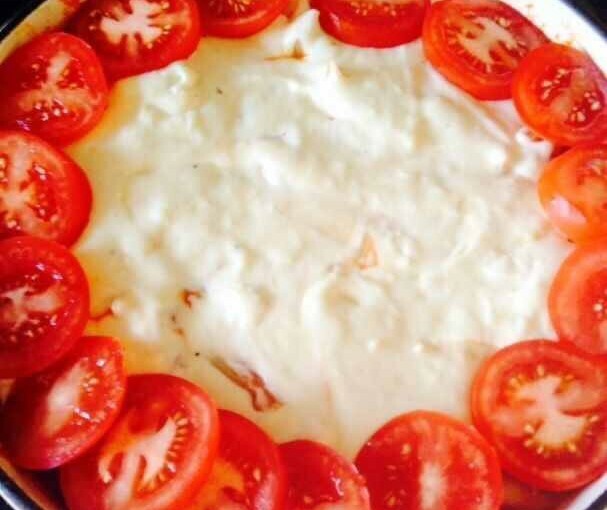 Since it can be served warm, it is a perfect barbecue or buffet dish. Indeed, when made in the morning, then left to sit for a few hours, the flavours develop, enhancing the overall deliciousness. 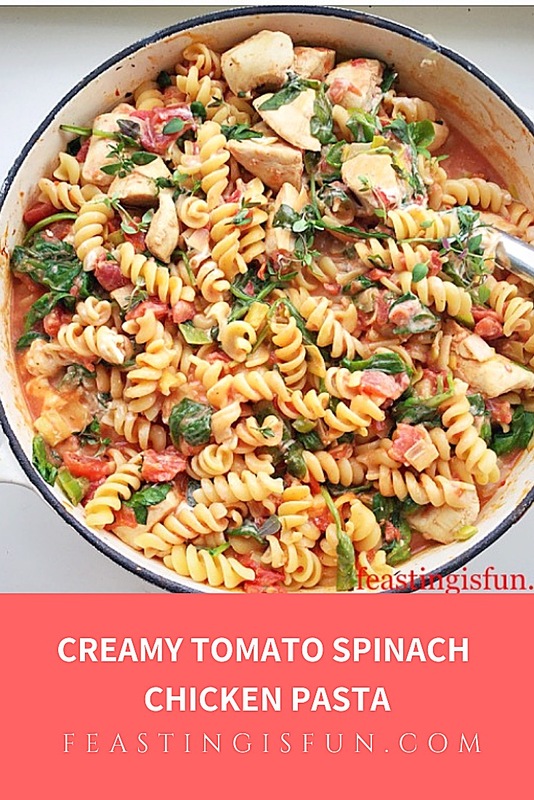 So easy to prepare and make ahead! 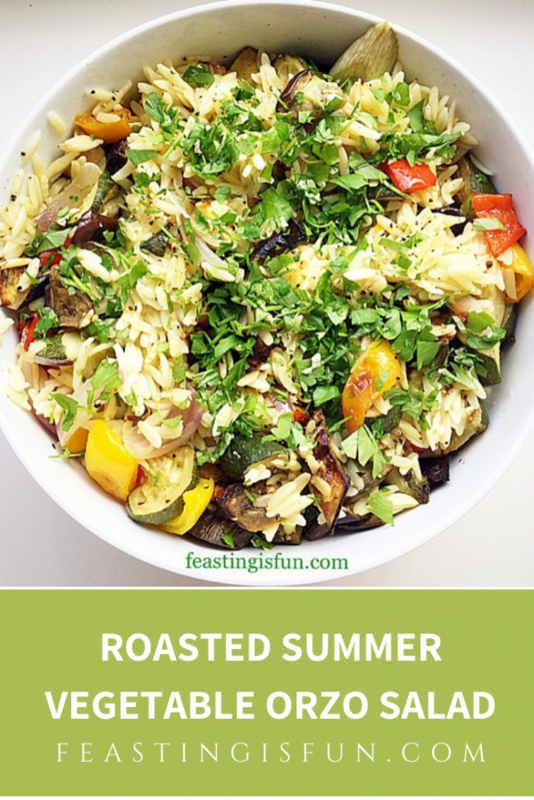 Roasted Summer Vegetable Orzo Salad full of goodness. As much as I enjoy a crunchy pasta salad, there is something very comforting in the softened, roasted vegetables here. While roasting they become slightly sweet, with a mere hint of caramelisation. And their flavour is enhanced by the fresh lemon juice in the vinaigrette. Also orzo provides the perfect bite, complimenting the vegetables. 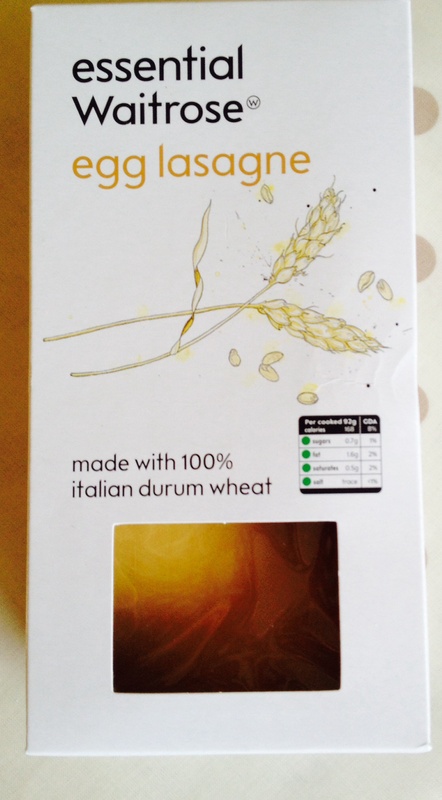 Resulting in a dish that lets the vegetable flavours shine, without being overly bulked out with pasta. Note: individual vegetables may be substituted according to preference. First of all, wash and thoroughly dry the vegetables. Follow by chopping into equal 1″/2.5cm pieces. 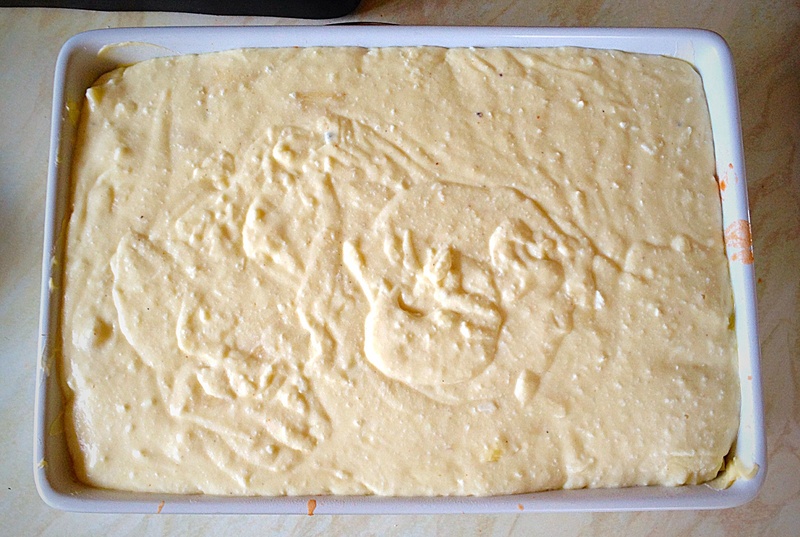 Transfer to a large baking tray. Drizzle over a generous tablespoon of olive oil and one quarter of a teaspoon of sea salt and freshly ground black pepper. 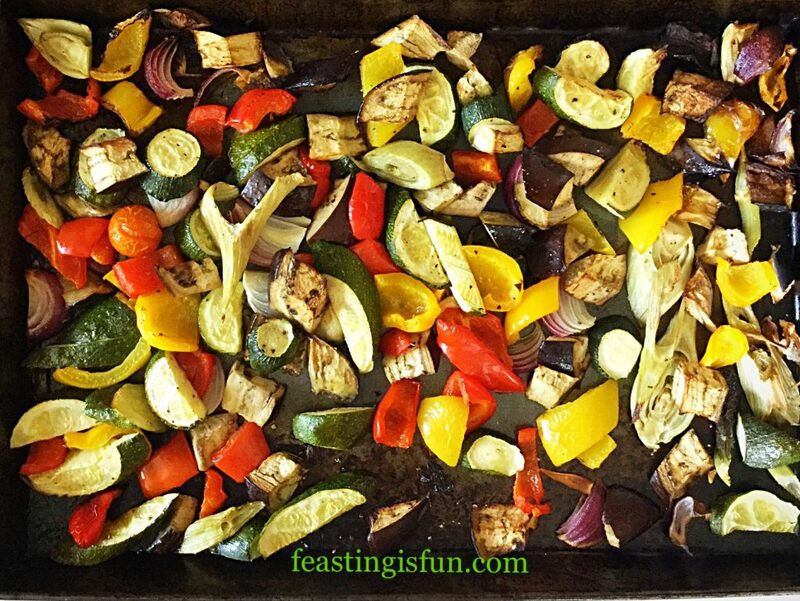 With clean hands toss the vegetables in the seasoned oil, taking care to cover each piece. Spread the vegetables out on the tray. During the cooking process they will reduce slightly in size. 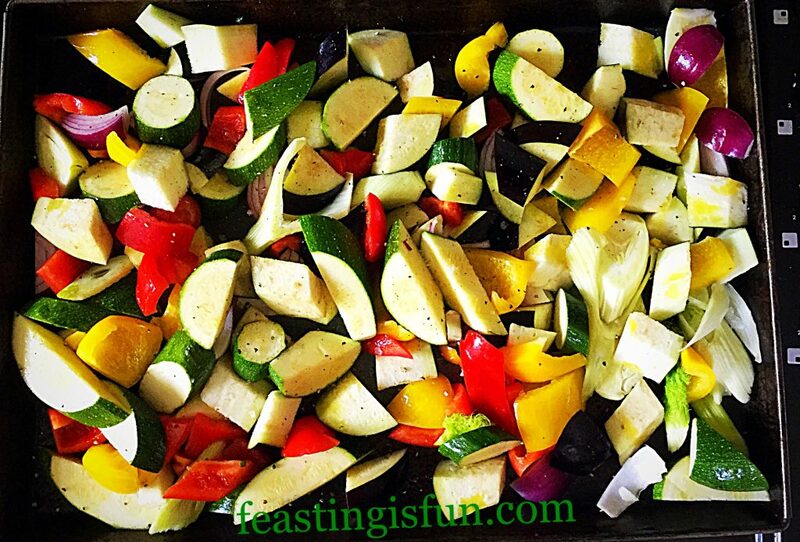 Prepared vegetables ready for roasting. 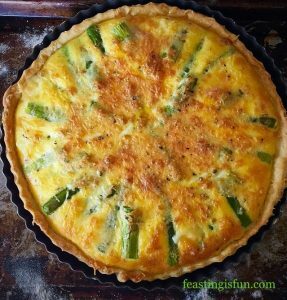 Place the baking tray into the centre of a preheated oven and roast for 30-40 minutes, turning the vegetables halfway through the roasting time. 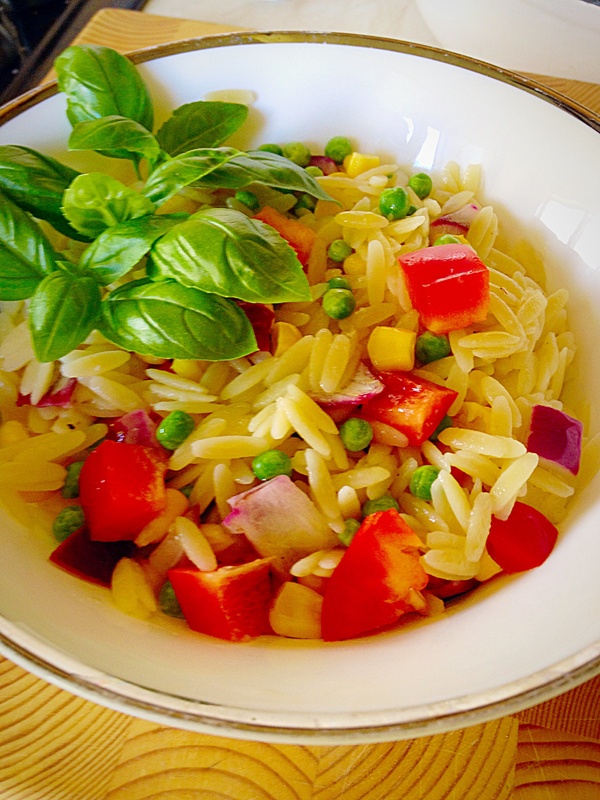 While the vegetables are roasting cook the orzo and make the lemon vinaigrette. Place a large pan of cold water on the hob and bring to a boil. When boiling add 1 tablespoon of sea salt and then add the orzo. Squeeze the fresh lemon juice into a small, clean jar that has a fitted lid. 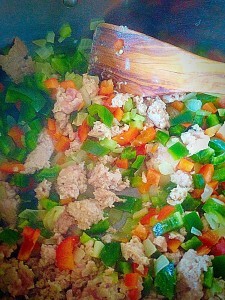 Add the extra virgin olive oil, 1/4 teaspoon of sea salt and freshly ground pepper. Place the lid securely on to the jar and shake vigorously to combine. Cook the orzo according to packet instructions, removing from the heat and draining 2 minutes before the finished cooking time. 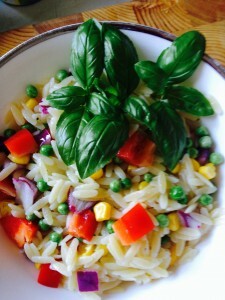 Place the drained orzo into a bowl and pour over the lemon vinaigrette. Fork through the orzo to ensure the vinaigrette covers each small piece, stopping the pasta from forming clumps. When cooked the vegetables will be softened, allowing a fork to easily pierce. 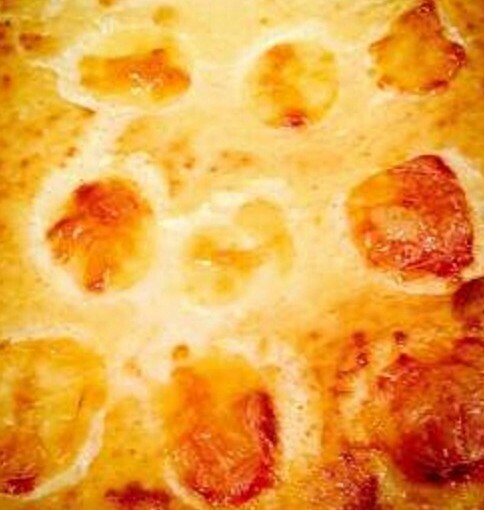 Some pieces may be slightly charred at the edges. 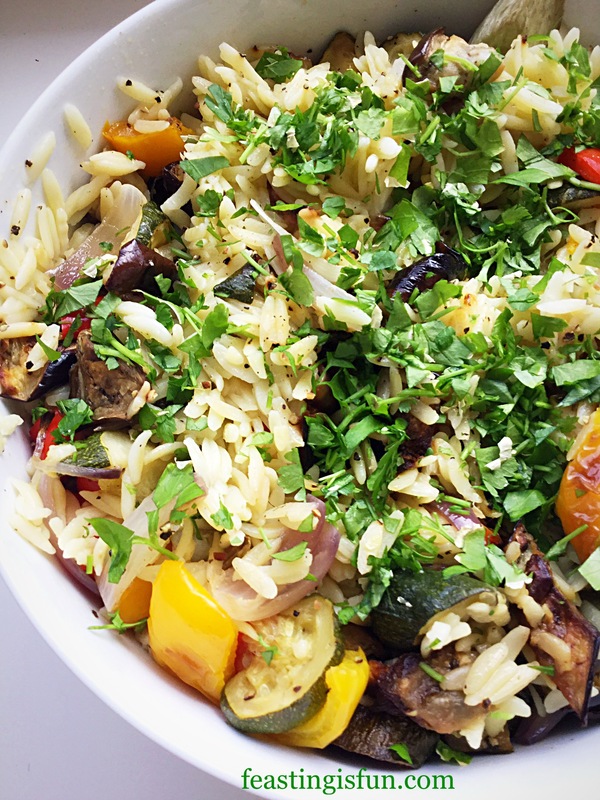 Spoon or tip the roasted vegetables on top of the orzo. Making Roasted Summer Vegetable Orzo Salad. Gently, use two forks to mix the roasted vegetables into the Orzo. Finally, roughly chop a handful of fresh parsley, discarding the stalks and scatter over the salad. 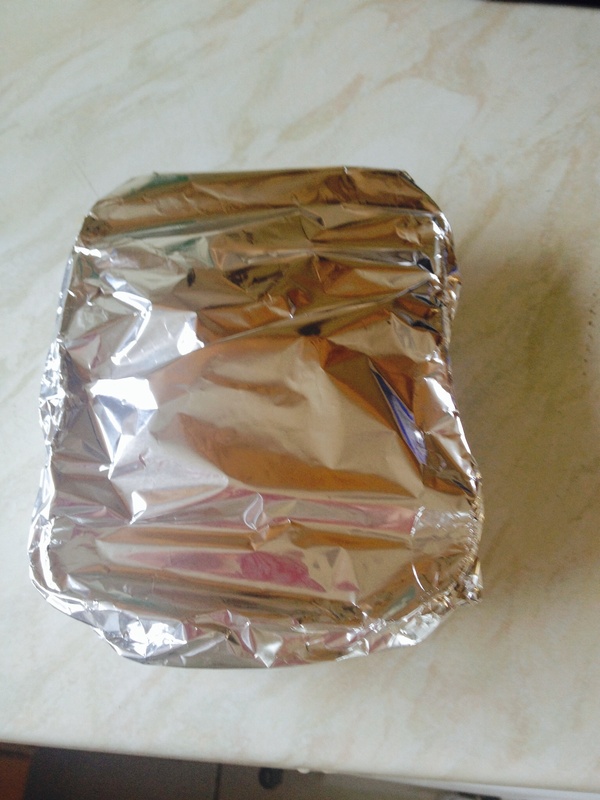 If making the same day as eating, cover with cling film and leave on the work top. Yet, when making the day before, leave out the parsley, cool, cover and store in the fridge. 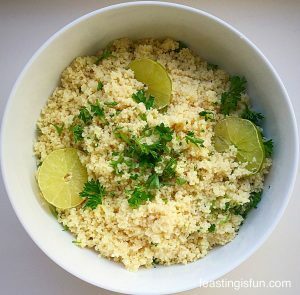 Remove and allow to sit at room temperature for one hour, garnish with freshly chopped parsley and then serve. Since this salad is so versatile, it can be served alongside grilled chicken, salmon, or burgers and ribs at a barbecue. 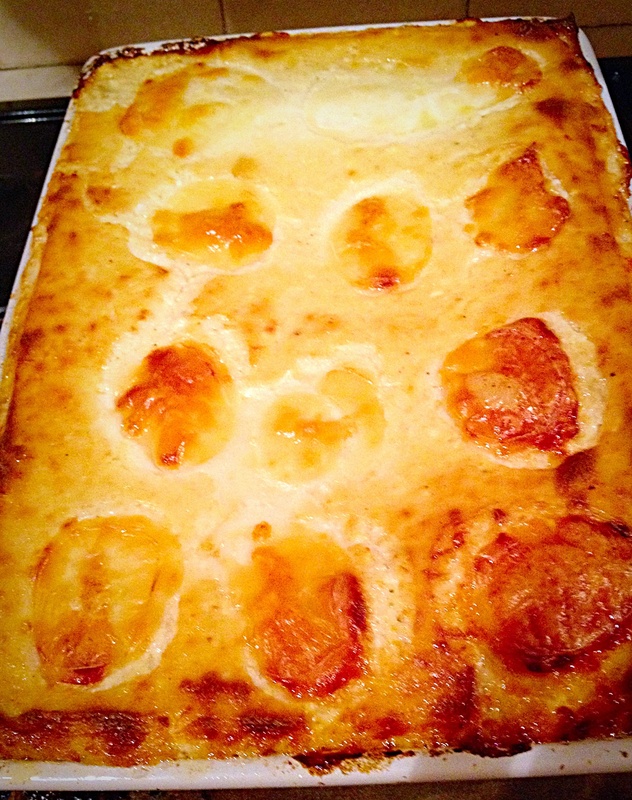 Likewise, it can also be served on its own as a tasty vegetarian or vegan meal. 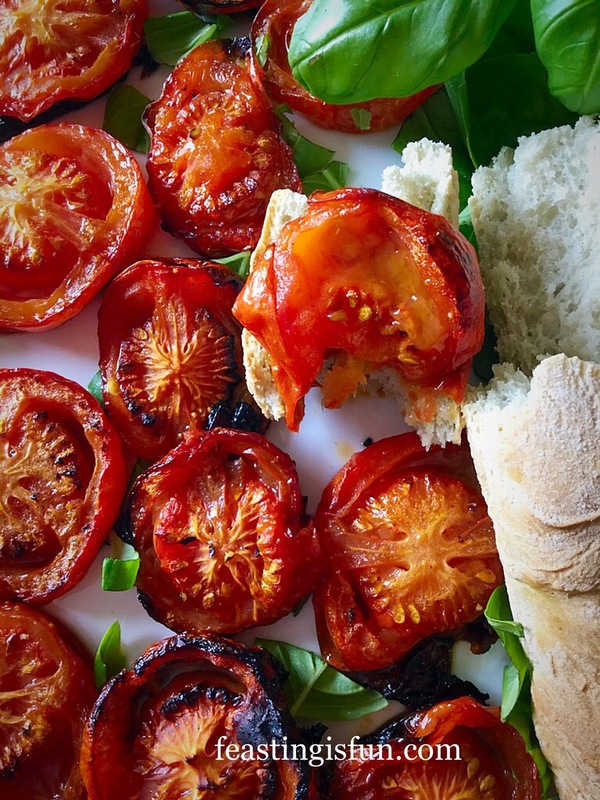 Roasted Pale Ale Jelly Tomatoes. While shopping in large supermarkets I find it can be easy to become disconnected with seasonal vegetables. Because of transportation most ‘summer’ vegetables can be easily obtained throughout the year. Since large, super greenhouses have cropped up across the country, most notably in Thanet, Kent, the effect on home grown produce has been to lengthen its season. Also ensuring the public buys British rather than imported produce. Most importantly I fully support this endeavour. Yet, even with this consideration, there is little to rival the fun of blackberry picking in August and September. Above all connecting us all to nature and the natural season of harvest. Whatever you are making, baking and creating in your kitchens, have fun preparing our feast. 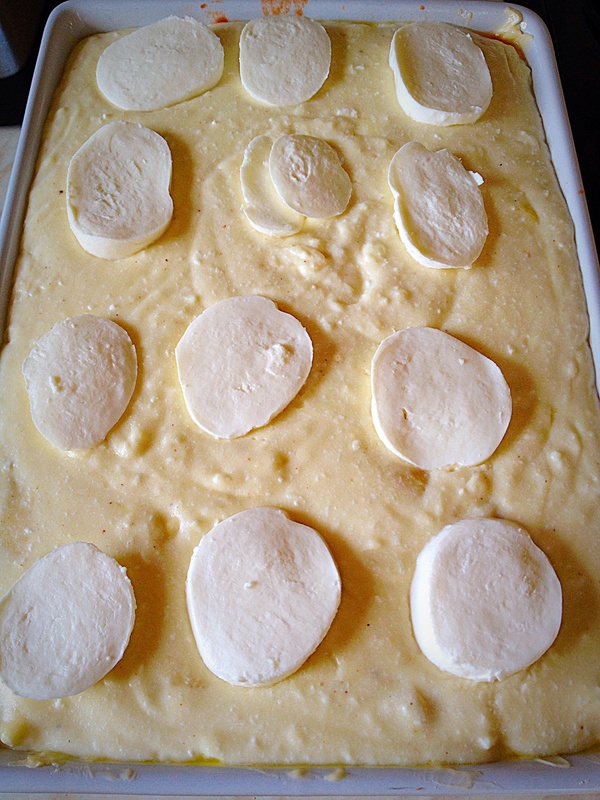 Hi, have I got the easiest, tastiest, make ahead side dish for you?? Oh yes I have! 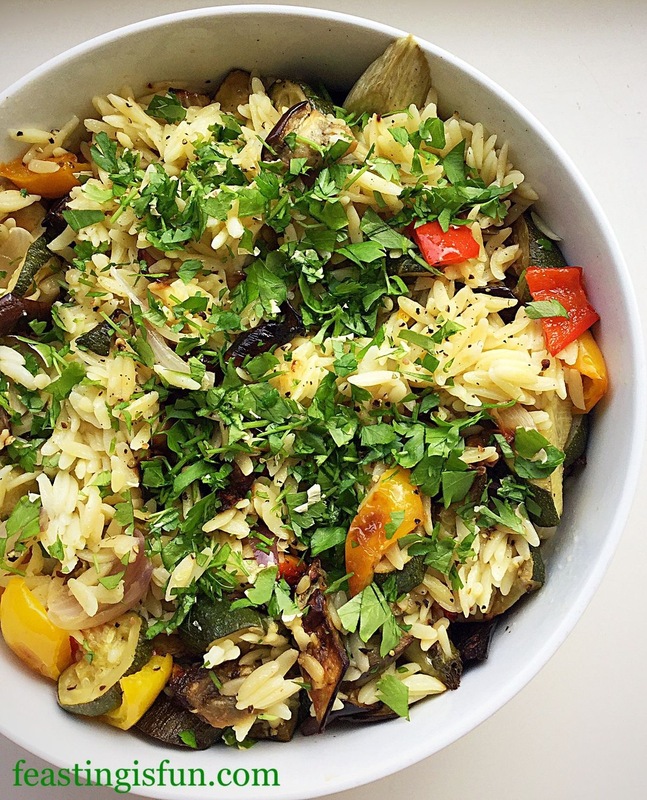 Lemon Garlic Vegetable Orzo. And this dish does not disappoint as it is delicious. 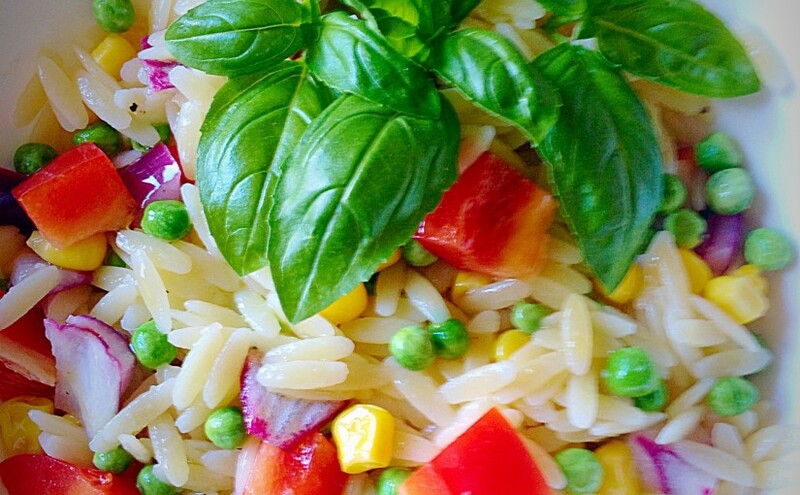 Soooo delicious – Lemon Garlic Vegetable Orzo – the perfect Pasta side dish. 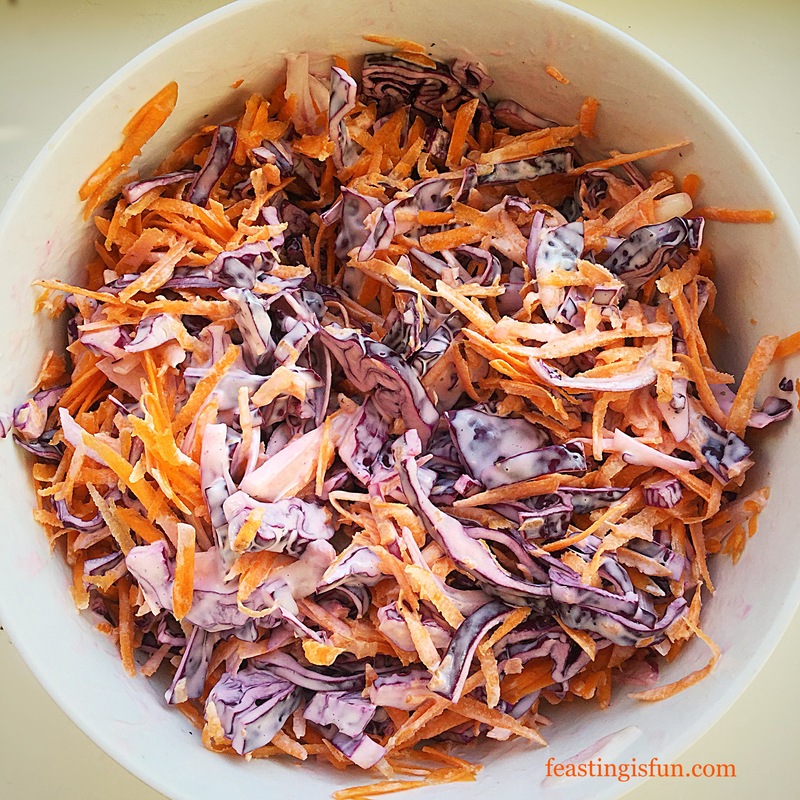 While I’ve said this is a side dish (and vegetarian), it also makes a fabulous light lunch. 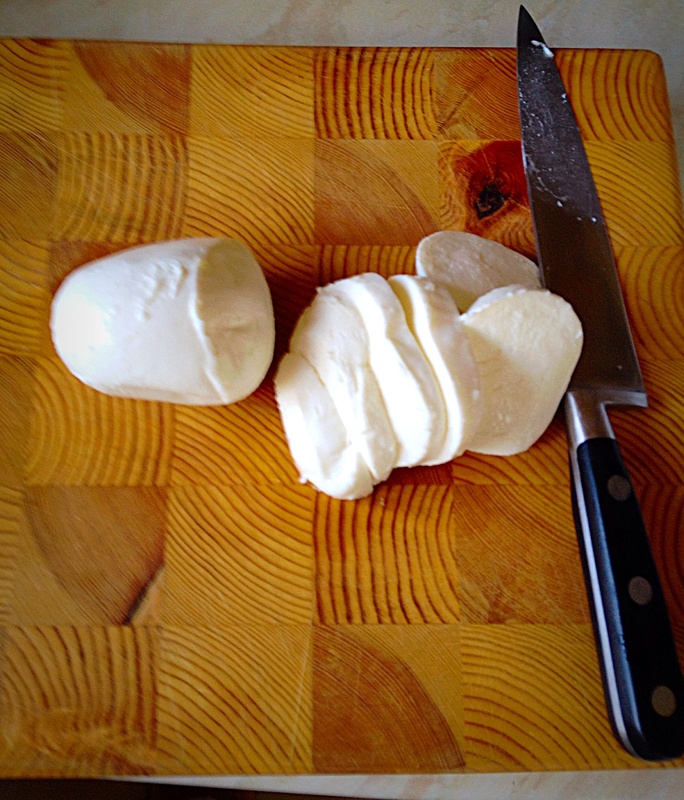 Simply adding a few shavings of Parmesan would add extra oomph for lunch, served alongside some crusty, crunchy bread. 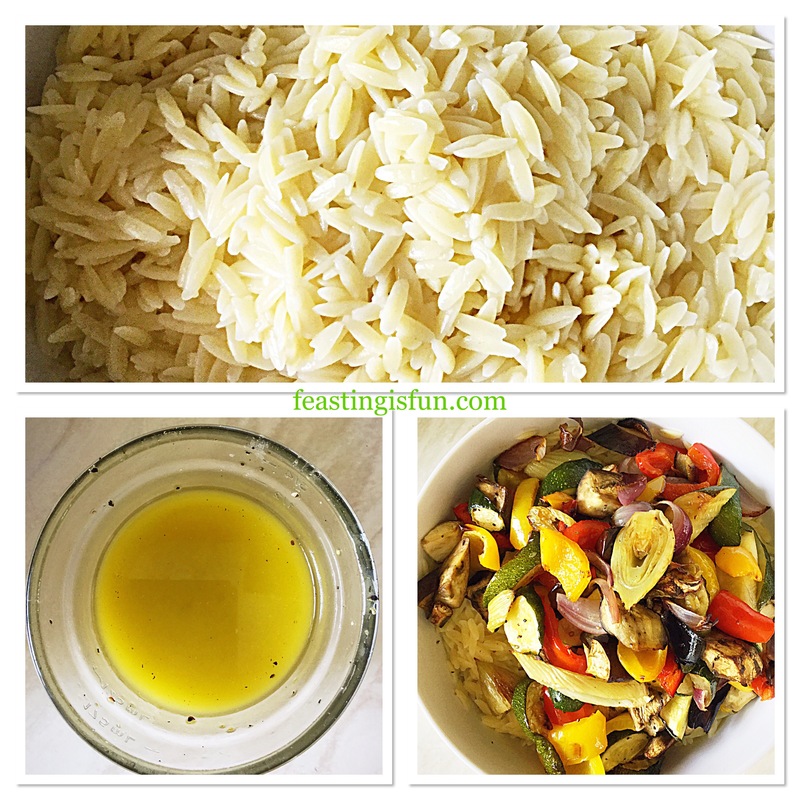 Lemon Garlic Vegetable Orzo – perfect served at room temp! 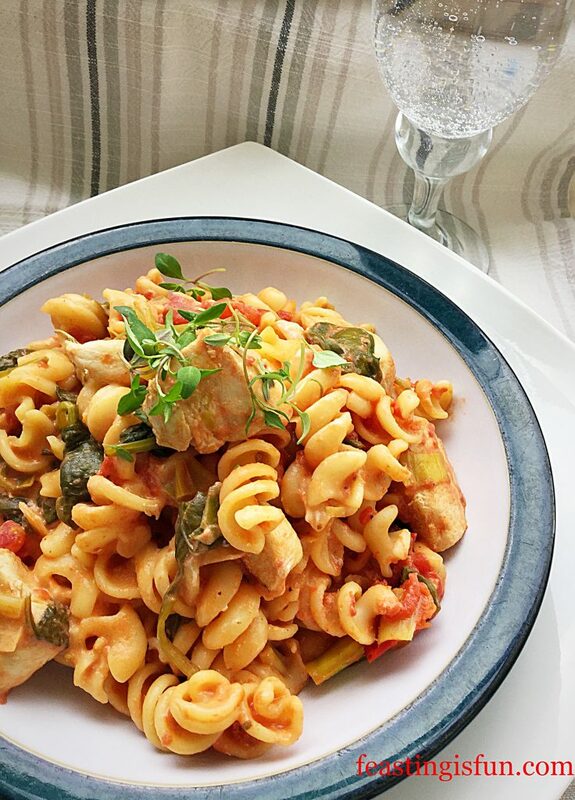 While I’ve used red onion, peas, sweetcorn and red bell pepper in this dish – but feel free to switch up the veggies (celery is good) with whatever you have on hand. 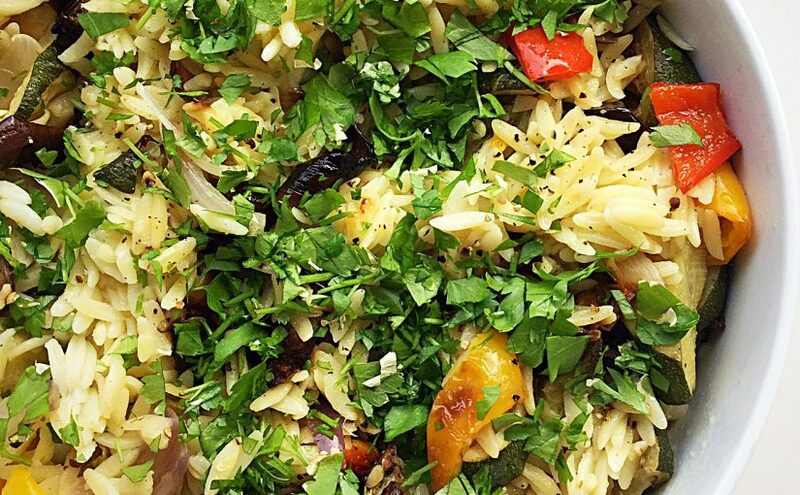 All I would say is the Lemon Garlic Vegetable Orzo is best served at room temp, or even warmed – BUT NOT COLD! 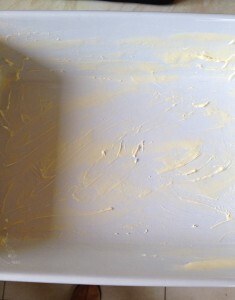 Because no matter how much lemon/oil you add, when served fridge cold the Orzo clumps together and not in a good way! 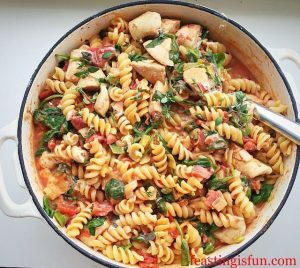 So there you go, an easy recipe that doesn’t take up any room in your fridge, or require any last minute fiddling. Yay!! We like easy! Recipe : Lemon Garlic Vegetable Orzo serves 6-8 as a side dish. First of all put a large pan of water on to heat up for the Orzo. Place the lemon juice and finely diced red onion into a large bowl. Add a pinch of salt and mix together. Also leaving the onion in the lemon juice will remove the acrid taste! 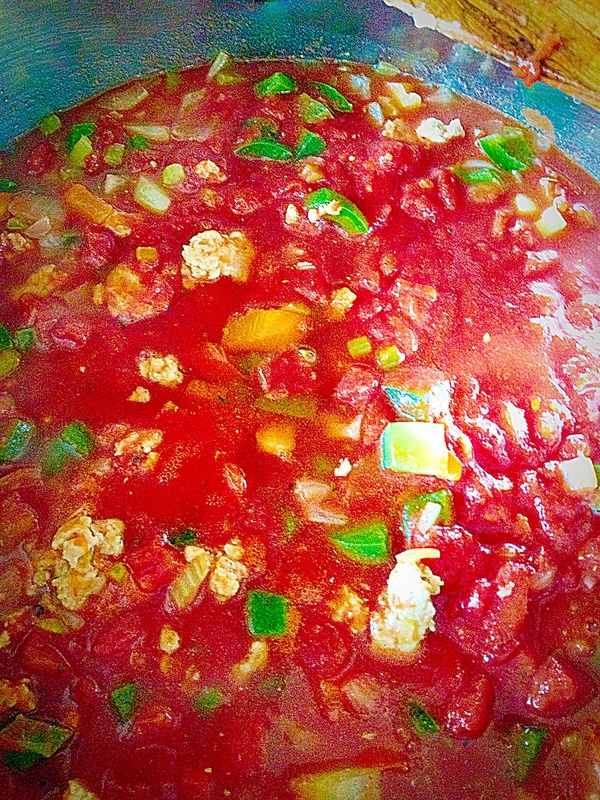 As soon as the water in the pan is boiling add salt and then the Orzo. Cook according to the packet instructions – taking care not to overcook or the Orzo will simply clump together!! While the Orzo is cooking gently heat the Olive Oil and garlic together, for approximately 2 minutes on a medium heat. This allows the garlic to infuse the oil. And also the garlic is lightly cooked. 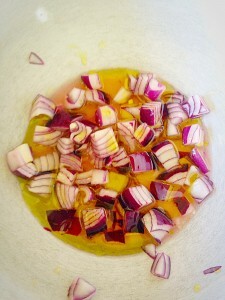 Pour the garlicky oil over the onions and lemon juice. 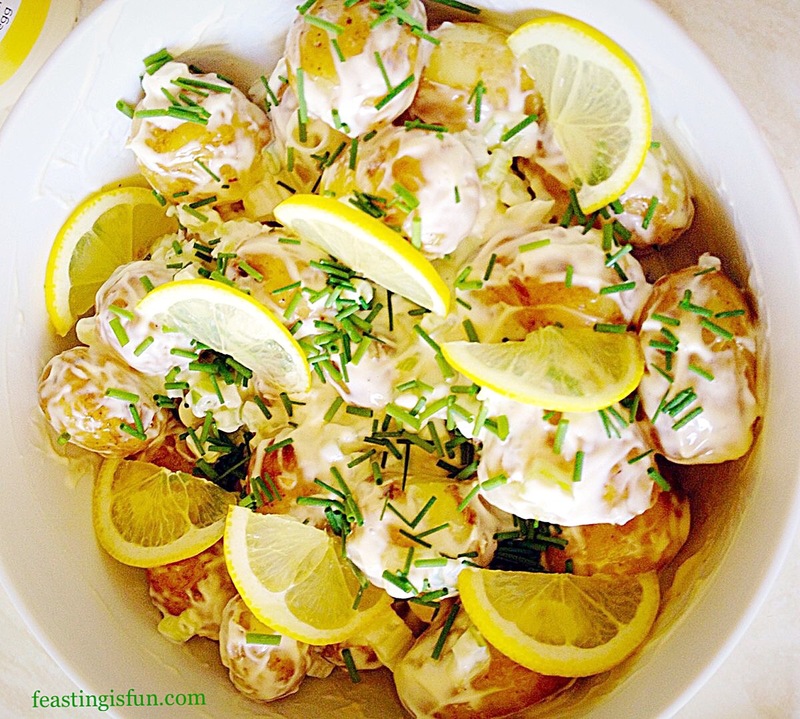 Lemon Garlic Onions and Oil – add salt and pepper. Drain the Orzo as soon as it is cooked and pour straight into the bowl. 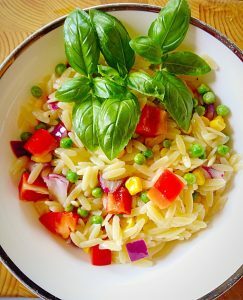 Using a large slotted spoon immediately toss the Orzo in the oil/lemon juice – this will stop the Orzo from sticking together. 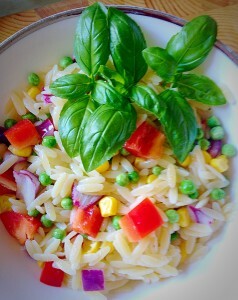 Place the frozen peas (I used petit pois) in the bowl and mix in with the hot Orzo. 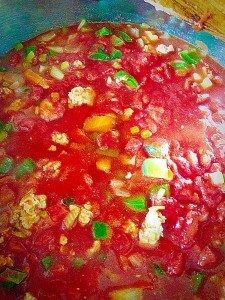 Add the sweetcorn (drained) and the diced, red, bell pepper. Mix together and taste for seasoning – add salt/freshly ground pepper as necessary. Take a handful of Basil leaves, roughly chop and sprinkle over. Cover with cling film and serve at room temp. 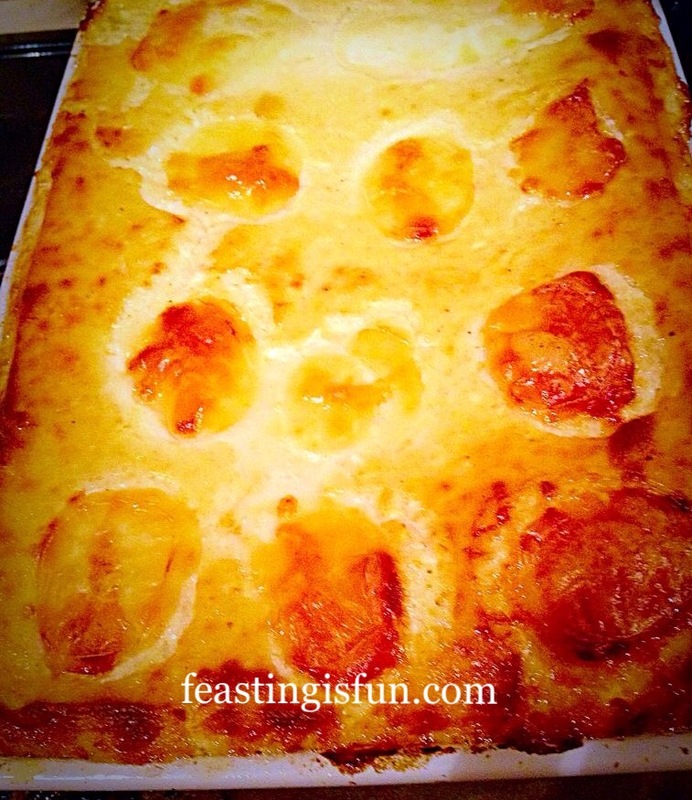 This side goes fabulously with fish – Salmon especially, Chicken and Pork. It makes a fab alternative to roast potatoes and hot veggies for a Summer roast and completely seals the deal as part of a buffet. With very little effort. Gotta love that?! Enjoy feasting on this scrumptious dish and may we have many sunny days ahead to spend with friends and family, having fun round the BBQ! Also, making sure there are hidden ‘Super-Soakers’ primed for action if it gets too hot – or boring!!!! What do you look forward to now the days are longer and the sunshine is out?? Hello there, thank you for stopping by to read my blog. 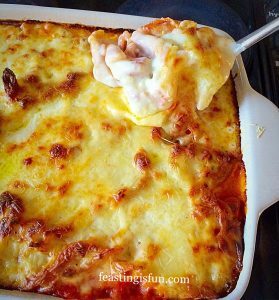 I hope it inspires you to make this delicious, very economical, Bacon Cheese Pasta Bake – covered in a scrummy Cheese Sauce! I’m sorry that I haven’t posted anything for a few days, unfortunately my body has been very uncooperative and I’ve been struggling with a lot of pain. Not looking for sympathy, just explaining. 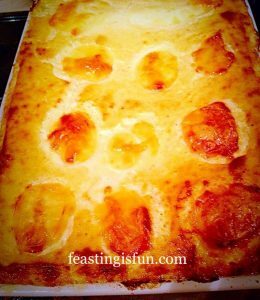 Anyhow this morning, once I was up and dressed I was determined to make the Christmas cakes ( I know this blog is about the Bacon Cheese Pasta Bake – but I have to tell you the whole story, so bare with please??!!). One cake for us and a smaller cake for my lovely hubby’s Ma and Pa. They love Christmas cake like no other people I have ever met and since I love them and making cakes I thought I’d bake them a cake as well! Once the cakes were happily baking away in the oven I turned my attention to dinner. I happened to have 8 rashers of streaky bacon in the fridge and thought ‘You know what, I’ll make Bacon Cheese Pasta Bake’. 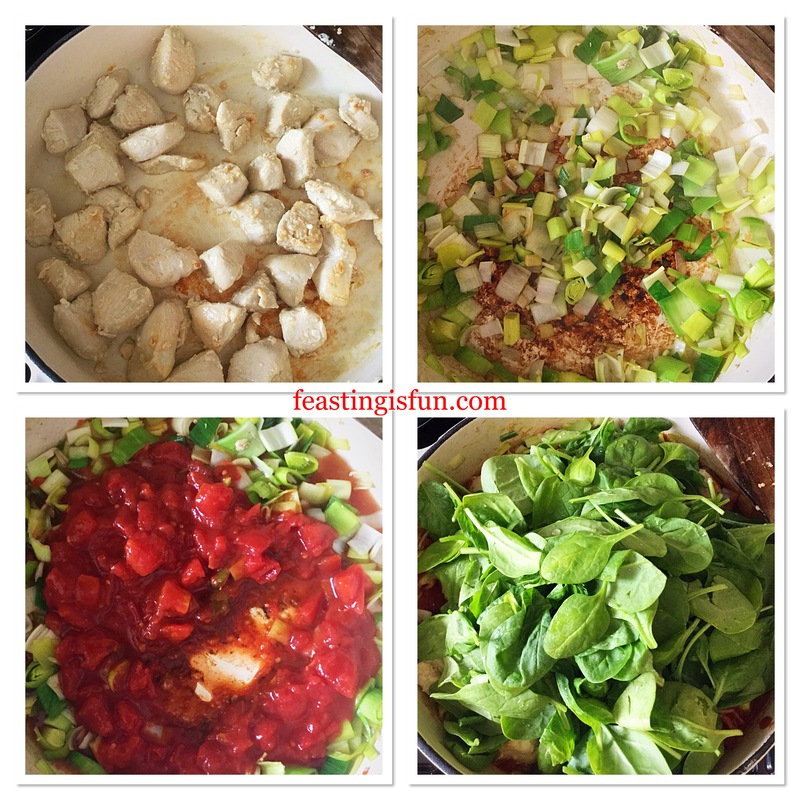 Not only that, but as I have tended to be a bit lazy with my savoury recipes, I also made a note of exactly what I used and took some photos to show you how to make it yourself!! In a large saute pan (or shallow casserole dish) melt the Olive oil and Butter together over a medium heat. Add the finely chopped Onion and Saute until translucent (approx 5-8 mins). Add in the Bacon – I usually snip this into approx 1/2″ pieces, directly into the pan, however you can chip up the Bacon with a knife and then add it. Let the bacon sizzle until it had rendered out some of it’s fat, but not so much that it goes crispy. 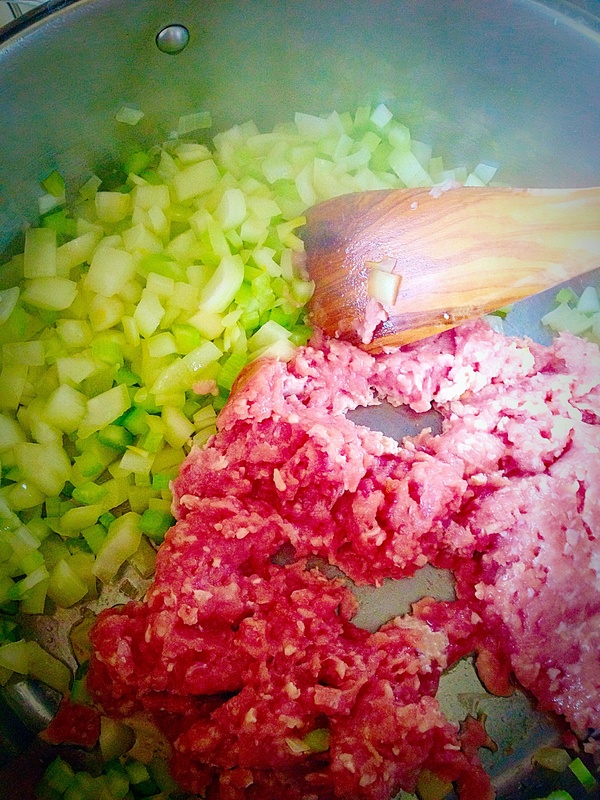 Add in the Celery and Carrot ( which have both been finely chopped and cook for another 5 mins. 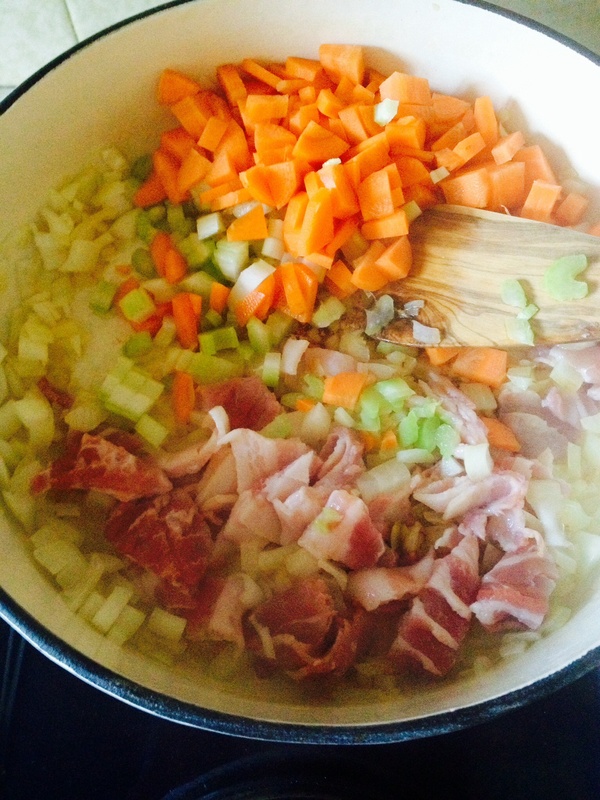 Sautéing the bacon, onions, carrots and celery. After 5 mins add in the finely chopped Green Pepper and the Mushroom ( I slice the mushrooms fairly thinly, then cut the slices in half – it just looks nice in the dish!). Add the crushed (or finely chopped) garlic and continue cooking for another 5-10 mins, until all the vegetables are slightly softened. 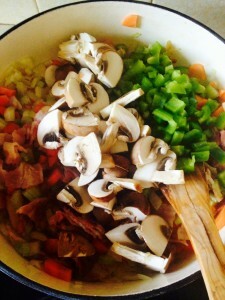 Green Pepper and Sliced Mushrooms added. How chunky or fine you chop your veg is entirely up to you!! 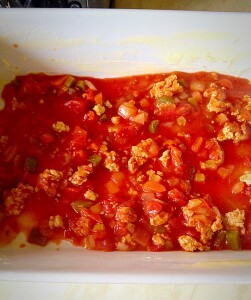 Once the vegetables have started to soften add the tinned, chopped tomatoes. Rinse each tin out with cold water (fill the tin to just over half with water and swish the tin to dilute any tomato juice left, into the water) and add the tomato purée. Add the seasonings next: salt, pepper, sugar, nutmeg and mixed herbs. 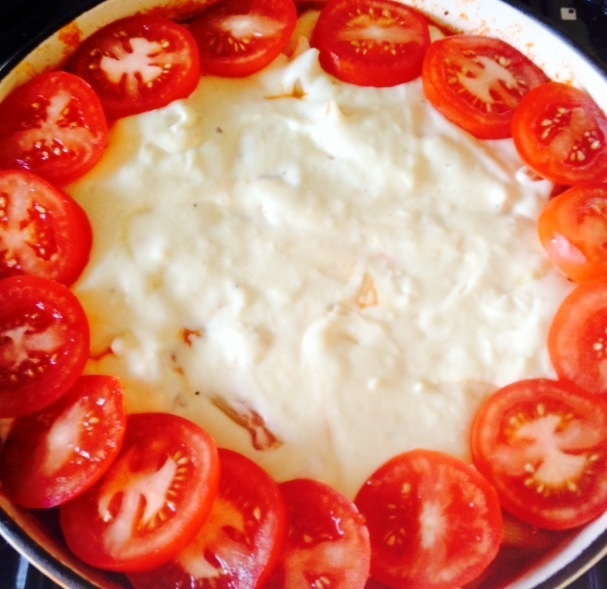 The sugar balances out the tartness of tinned tomatoes and makes a very real difference to the finished dish. 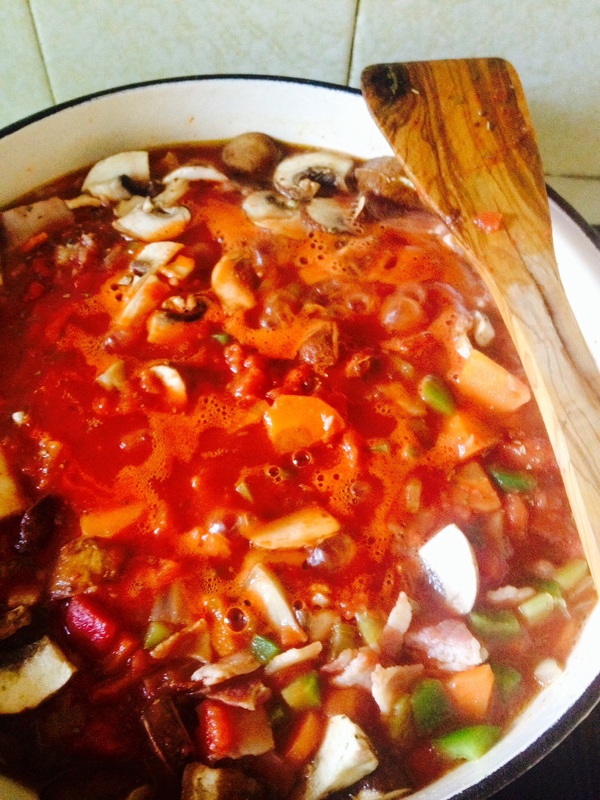 Allow the bacon, vegetables and tomatoes to bubble away, uncovered, on a low-medium heat for at least an hour. Melt 2tbsp butter on a medium heat in a saucepan. Once melted add 2tbsp of plain white flour and mix thoroughly, lowering the heat very slightly. Cook the flour and butter together for a couple of minutes to get rid of the ‘raw flour’ taste. 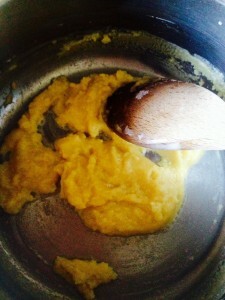 This flour/butter mixture is now called a roux. 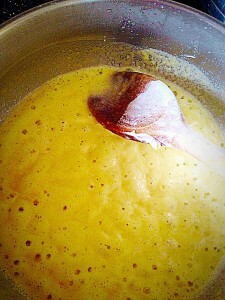 Now gradually add (50ml at a time at the beginning) whole milk to the flour/butter mixture, stirring constantly. As the milk warms it will gradually become incorporated into the flour/butter. 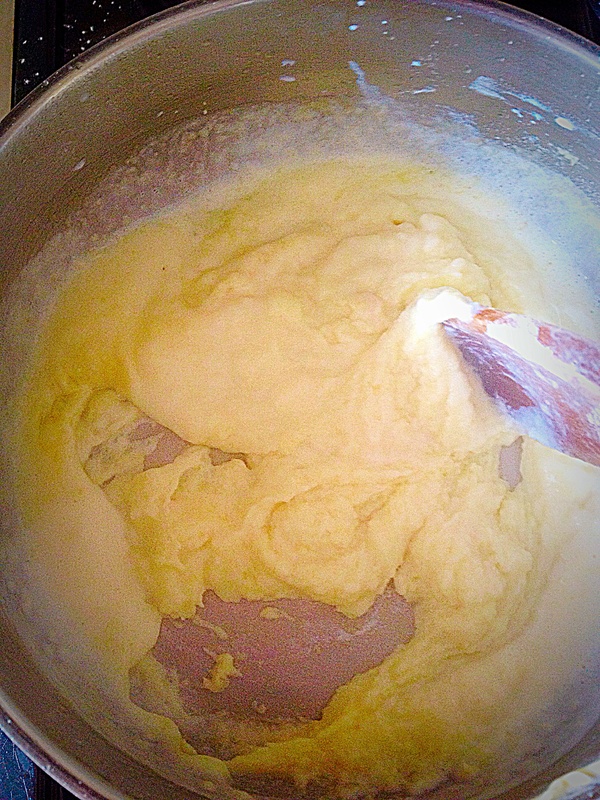 In the beginning, for the first few milk additions, the mixture will be very thick and stiff to stir. 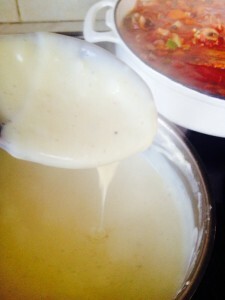 If you find the milk is not incorporating into the mixture, or it is very lumpy, it’s fine to switch to a whisk, this will ensure a beautiful, lump free, smooth sauce. 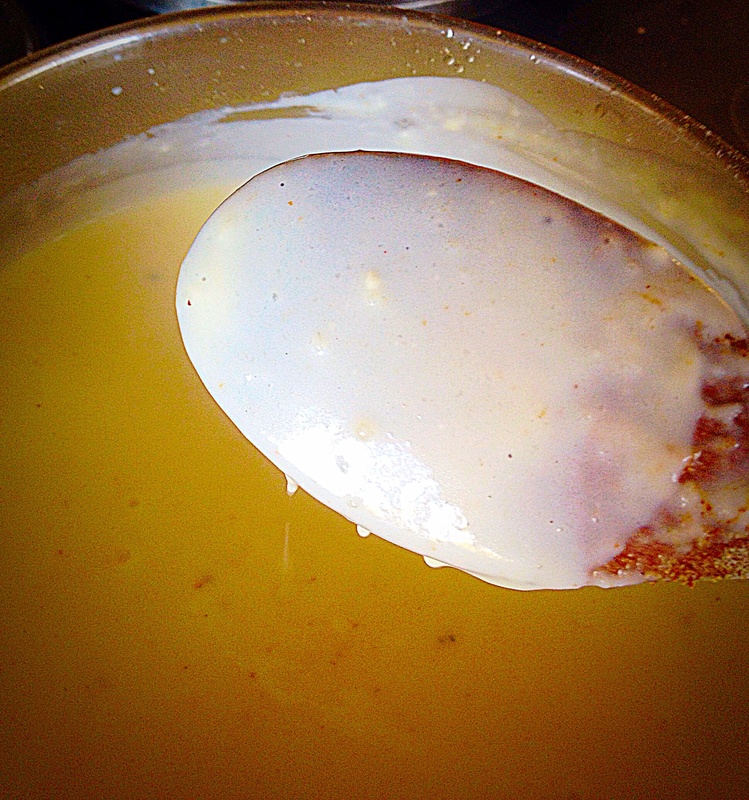 Add 450-500ml of milk until your sauce has the consistency similar to custard. Lump free, smooth white sauce!! Easy!! Add a pinch of salt, a good grinding of black pepper, 1/4 tsp freshly grated nutmeg and mix thoroughly. 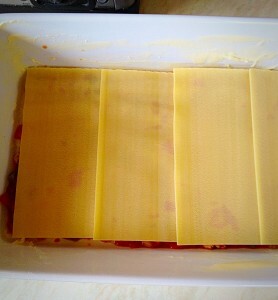 Off of the heat add a good 2 handfuls (4-6oz) of grated mature cheddar cheese. 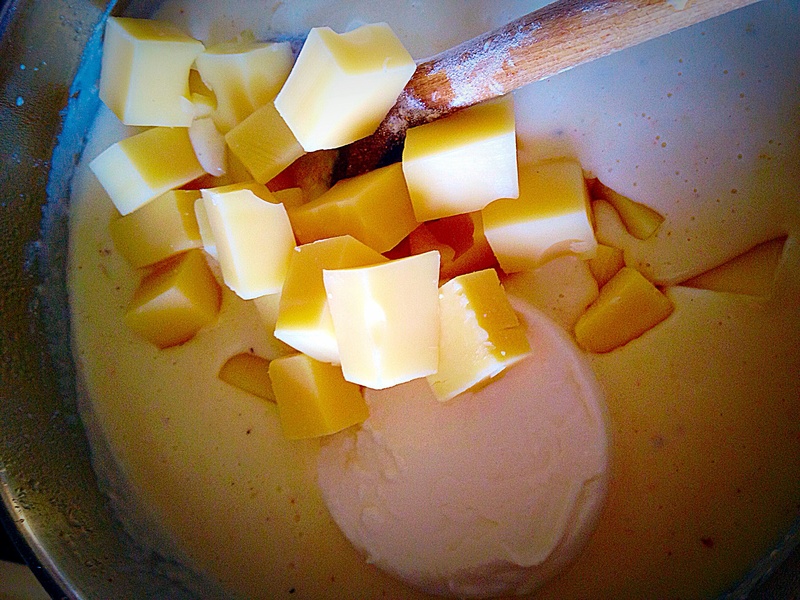 Mix thoroughly until the cheese has melted into the sauce. 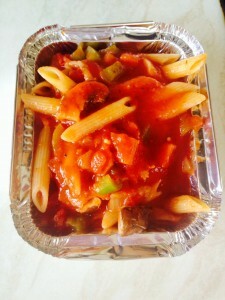 I have used penne rigate pasta for this dish. Basically pasta tubes, cut on a slant with ridges in the outside! I like penne rigate as it holds firm, the sauce not only goes into the pasta tubes, but also the sauce clings to the outside ridges of the pasta. I cooked about 3/4 of a 500g packet (350g if my maths is correct??). 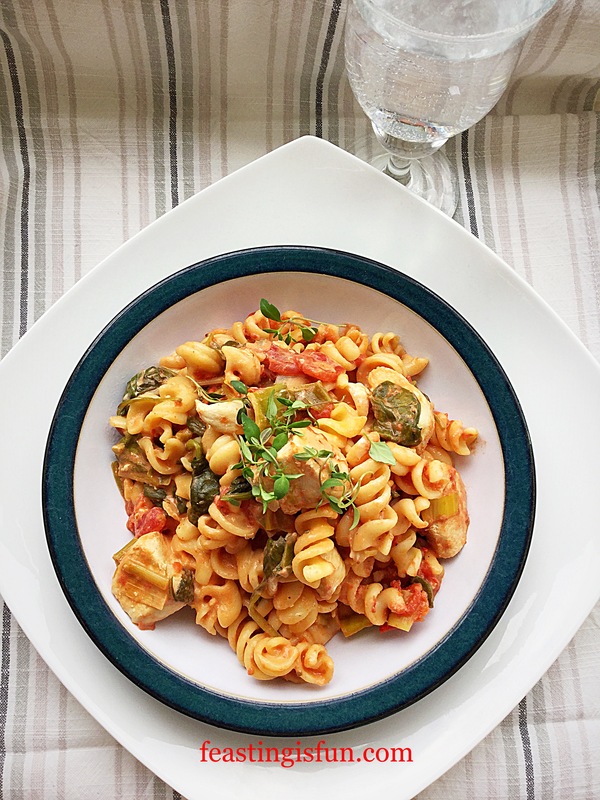 I said earlier, this is such an economical dish – 8 bacon rashers, bits of veg you have in the fridge, a couple of handfuls of mature cheddar and not even a whole packet of pasta!! Not only that but it tastes fab and is easily transportable, so ideal to give individual portions to friends/family or pop in the freezer!! 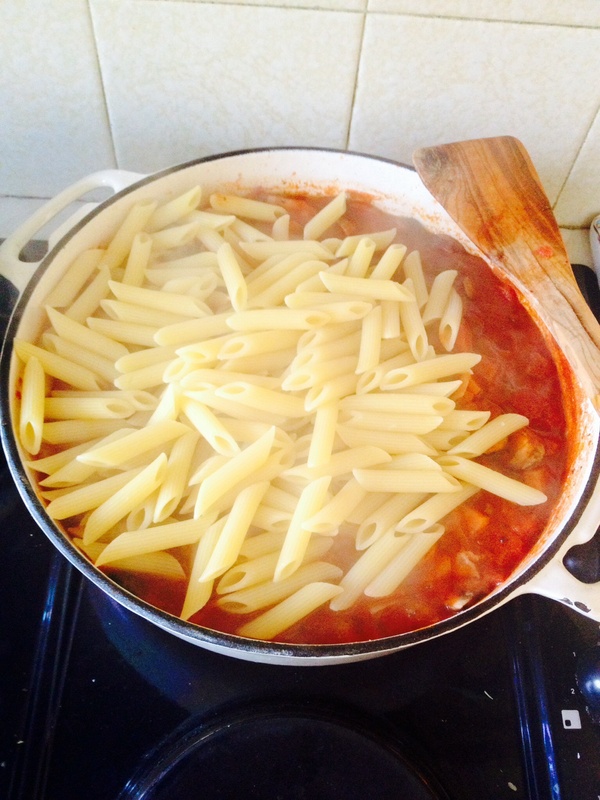 Once the pasta is almost cooked (not quite al dente) drain and add to the bacon sauce. The pasta dumped on top of the bacon sauce. Mix the sauce and pasta together. 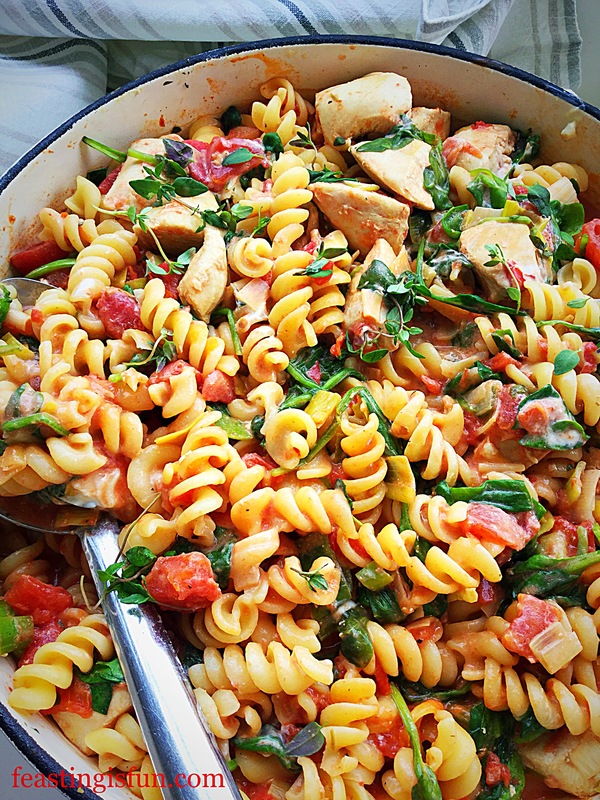 If serving a separate portion to give away, remove a generous portion of the pasta/bacon mix, ensuring you get a good mix of the sauce, bacon, veg and of course pasta. 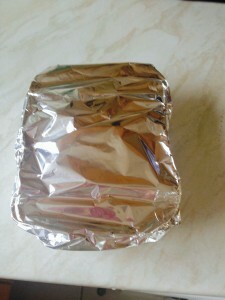 Not the most elegant container, but foil containers make transporting, or freezing the individual portions sooooo easy!! 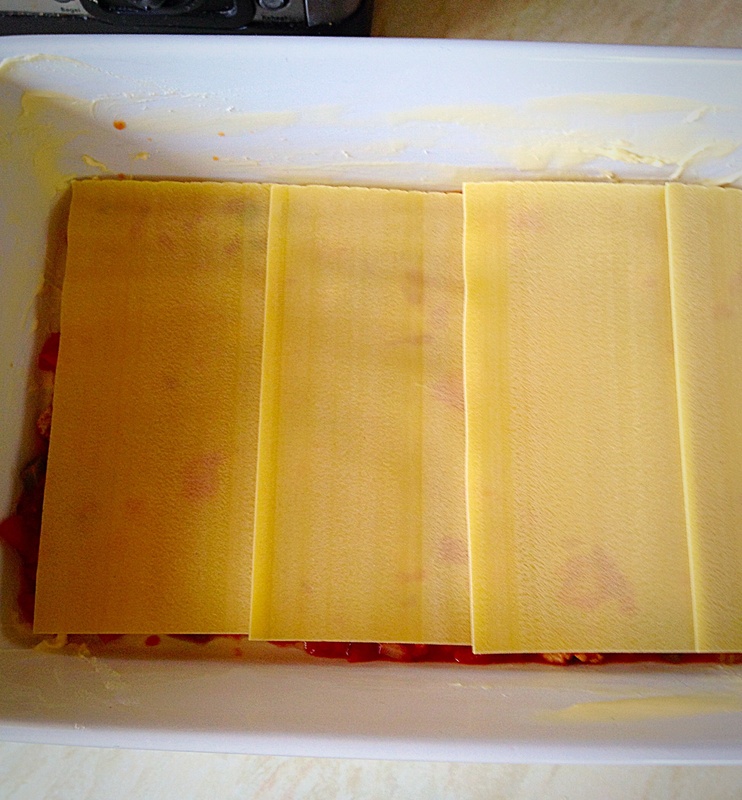 Spread the rest of the bacon pasta evenly into an ovenproof container. 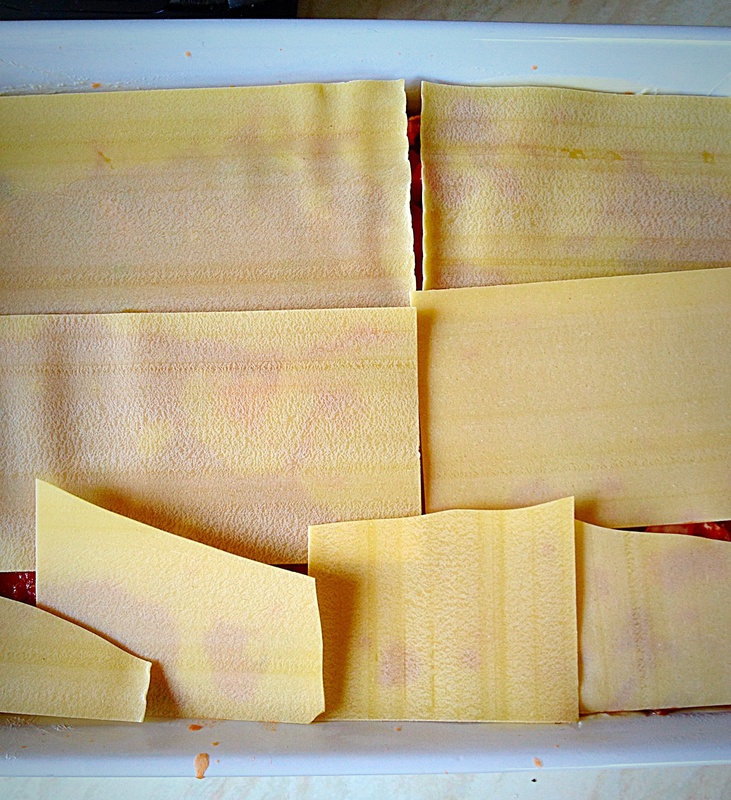 Tap the individual portions to settle the pasta and remove any air bubbles. Cover your pasta dishes with a good dollop of the cheese sauce. For added prettiness (and because the cheese sauce didn’t reach the edges!!) 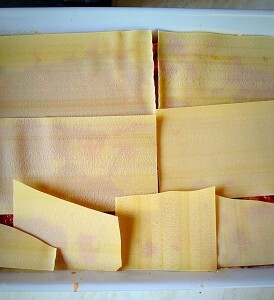 I sliced ripe, ruby red tomatoes and placed them around the outside edge of the pasta. Slightly overstuffed, once the cheese sauce was added, so just wrapped in foil. 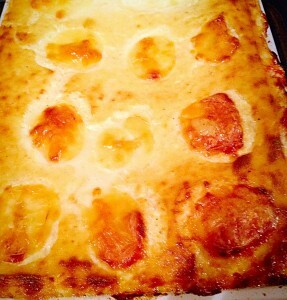 One individual portion ready to go!!! 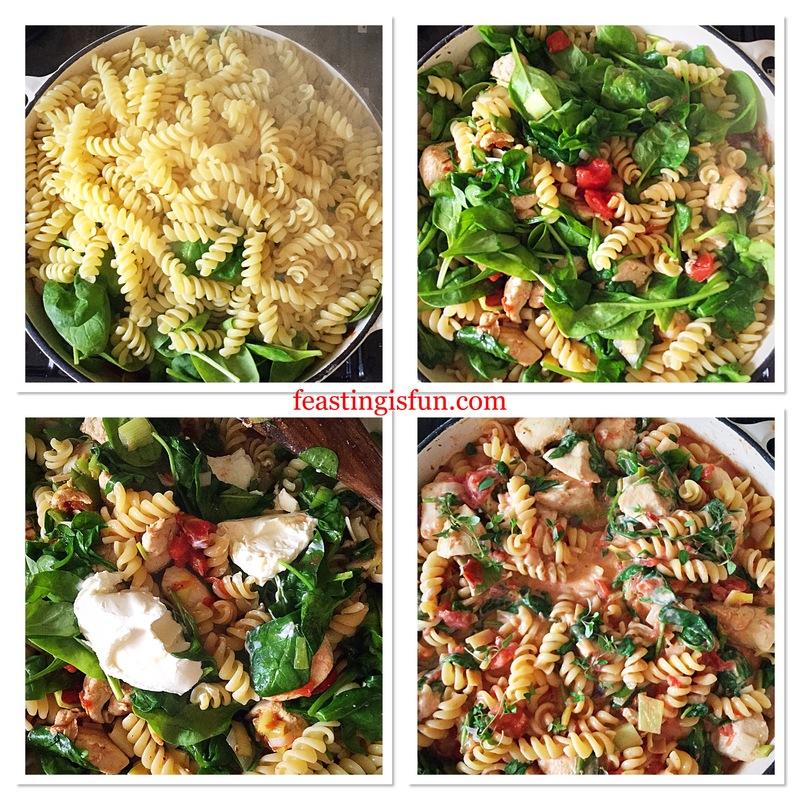 So a super tasty, super economical meal to eat and share! 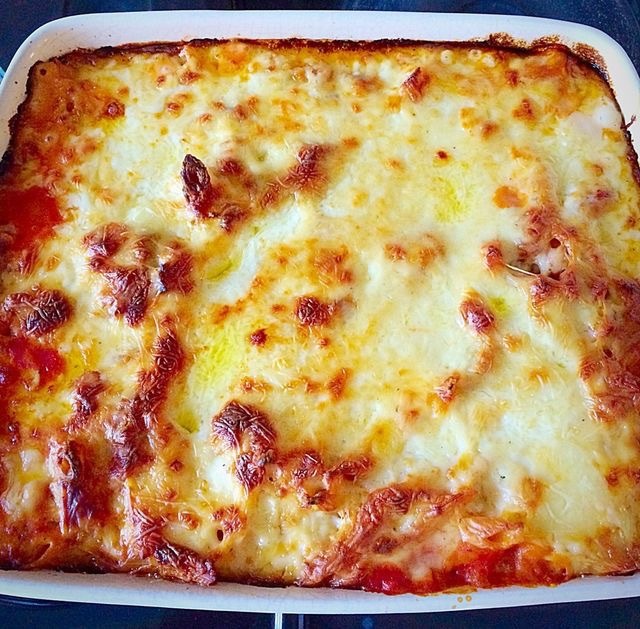 For a bubbly,scrumptious meal, ready for the table: Cook the large Bacon Cheese Pasta Bake at 180C for an hour until thoroughly heated through, 1/2 hour at the same temp for the individual portion. 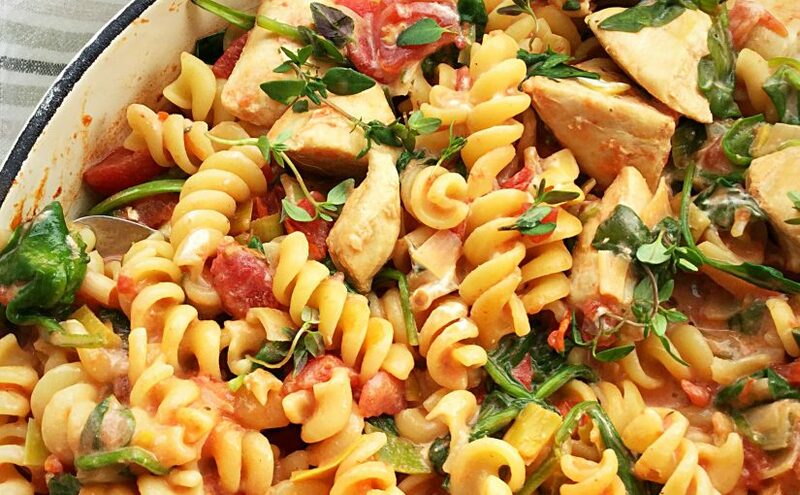 An amazingly tasty, versatile dish that’s easy on your wallet and tasty on your tongue. Have fun, feasting and enjoy sharing your meal! !